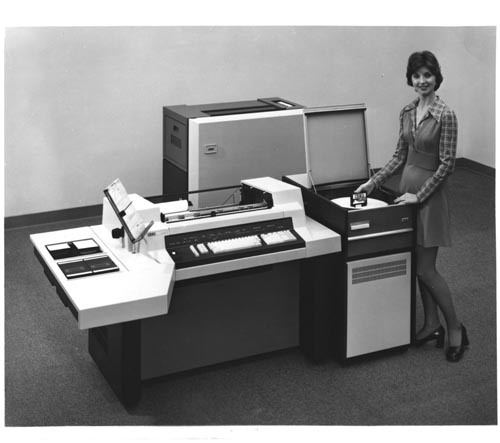 B&W image of woman standing beside the NCR 499 processing system. She is loading a disk pack. "NCR 499 data processing system can accomodate a variety of peripheral units so that the sytem can grow as the user's requirements grow. Show above is the basic 499 system with optional line printer and disk unit. The latter has one fixed head and one removable disk pack, with a combined storage capacity of 9.8-million bytes. In addition to functioning as a free-standing, general purpose processor, the 499 can be used as an intelligent terminal in a communications environment."